We believe to become truly educated, students must recognize and develop their intellects, their talents, and their aspirations. That’s why we advocate developing the whole person through various programs and activities available throughout our community. We offer English as a Second Language (ESL) based on student need. At registration, school personnel identify and evaluate English language learners to determine the level of intervention they require. 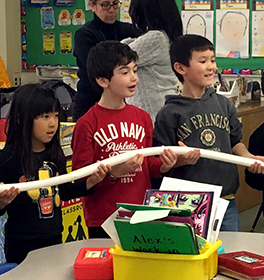 The Next Generation Science Standards (NGSS) reflect a new vision for American education—the interconnected nature of real-world science. Teachers engage their students in learning experiences that provide exposure to science and engineering practices, crosscutting concepts, and disciplinary ideas. The K–4 Paramus Science Committee studied NGSS, researched applicable programs, and wrote curriculum fitting with new standards and dimensions. The Paramus curriculum, based on the New Jersey Student Learning Standards for Mathematics, offers conceptually based learning experiences for our students designed to build and expand number sense and procedural fluency. Throughout the elementary years, students use a wide variety of grade appropriate manipulatives to build mathematical understanding. The ultimate goal of our program is for students to become mathematically proficient, engaged problem solvers who create solutions as they grapple with real-world problems.